The workshops in Northampton and Somerset provide two vital hubs for Tripod Crest, providing support 24/7. Craig Baker and his team of technicians provide an out-of-hours service for many companies, offering a one hour call out time within a 50 mile radius of the two sites. This extends to providing a recovery service for vans, planers and all surfacing equipment. The workshop team also maintains all our vehicles and plant. While a call out can always be arranged, such is the calibre of the technicians who man the call centre, there is often no requirement for a fitter to travel as the problem is resolved over the phone. On-site servicing is available too. 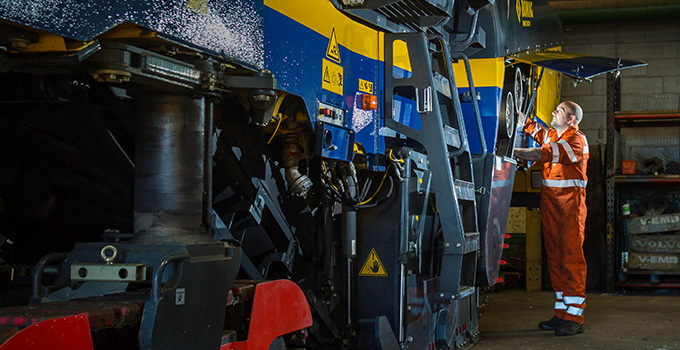 The workshop team can also provide long term maintenance arrangements for HGVs, vans, planers and all surfacing equipment – in addition to brake testing, emissions testing and trailer refurbishment, offering a service that is efficient, flexible and also very cost effective.